Tomorrow's final day showdown at the 2013 Maxi Yacht Rolex Cup, organised by the Yacht Club Costa Smeralda in collaboration with the International Maxi Association, promises to be gripping. Verdicts in some of the competition classes are in, while the permutations in the others promise high drama for the conclusion to proceedings. Coastal courses through the Maddalena Archipelago were organised today for the entire 37-strong fleet, 38 miles for the Mini Maxis and Wallys, 31 for the remaining classes. The winners were: Rán 2 (GBR) in the Mini Maxi Rolex World Championship; Rainbow (NED) in J-Class; Aegir (GBR) in Maxi Racing; Altair (ITA) in Maxi Racing/Cruising; Firefly (NED) in Supermaxi; and J-One (GBR) in Wally. Class leaders after four days of racing are: Alegre (GBR) in the Mini Maxi Rolex World Championship; Rainbow in J-Class; Highland Fling (MON) in Maxi; Altair in Maxi Racing/Cruising; Nilaya (GBR) in Supermaxi and J-One in Wally. Alegre has resumed control of the topsy-turvy Mini Maxi Rolex World Championship following two disappointing windward-leeward races yesterday. A second place today puts her back on top of the standings two points ahead of Niklas Zennström's Rán 2. Leader going into the day, Shockwave (USA) had to settle for fifth and now heads into tomorrow as an outside bet, four points adrift. The crew of 2010 and 2011 champion Rán 2 are delighted with their return to winning ways. "We had a terrible day yesterday," admitted navigator, Steve Hayles. "Probably one of our worst days on the water. We made mistakes front and back. Last night was a difficult time for everyone." Hayles attributes the togetherness of Rán's close-knit group as key to their return to form. "Today was critical. After a bad day, we always come back with a fighting spirit - it's a real strength of our squad." Two solid coastal race performances - which cannot be discarded - have put Rán 2 in a promising position heading into the final day. "You get a little bit more space in coastal races," explains Hayles, "we had a small lead at the first mark and ended up leading the race but it was close on a few occasions. Alegre got within a few feet of us. It was a four hour race so we worked very hard for our win." The erratic nature of the week's conditions and fleet's inconsistent performances means it is difficult to call a winner. "It's the closest racing we've had here in the four years (of the Mini Maxi Rolex World Championship)," says Hayles. "Throughout the fleet the boats are competitive, in the light airs Shockwave is a fantastic boat, a bit more breeze and Bella Mente is unstoppable. I think for us the shiftier and more difficult it is, the more opportunity we have." After two days of competition in the Maxi Racing division it seemed Lord Irvine Laidlaw's 82ft Wally hybrid Highland Fling was on the verge of retaining the title she won in 2011. However, the competition has been blown open as Hasso Plattner's older canting maxZ86 Morning Glory (GER) a winner here in 2007, has clawed back level showing her potential in the better breeze of the last two days. Tomorrow is essentially a match race for the class title. "We've had a great battle with Morning Glory from day one," explains Highland Fling tactician, Peter Holmberg. "The first two races were very close, same thing yesterday but in a little more breeze her performance went up. It is nice that racing is so close, that it only takes one or two errors to win." A torn spinnaker didn't help Highland Fling's cause today allowing Morning Glory to pull away although it was Brian Benjamin's Aegir which claimed the bullet. "We hoped to see more wind than we saw. It was a light run into the Maddalena and in there we saw 12-14 knots for a short while before the wind got lighter again," explained Morning Glory tactician Jens Christensen. A dramatic final day is ahead. "We have to win tomorrow. Its up to us," confirms Christensen. For the first time this week, Rainbow has assumed leadership of the J-Class following a bullet and Velsheda's disappointing third. It is another head-to-head tomorrow with Rainbow enjoying a one-point lead. Far from being the newest boat in the Wally class, Jean Charles Decaux's J-One has been the most impressive. A fourth bullet of the week has extended her lead over Sir Lindsay Owen-Jones's Wally Cento Magic Carpet 3 to an unassailable six points. Decaux has sealed a second Class title, a first since 2007. 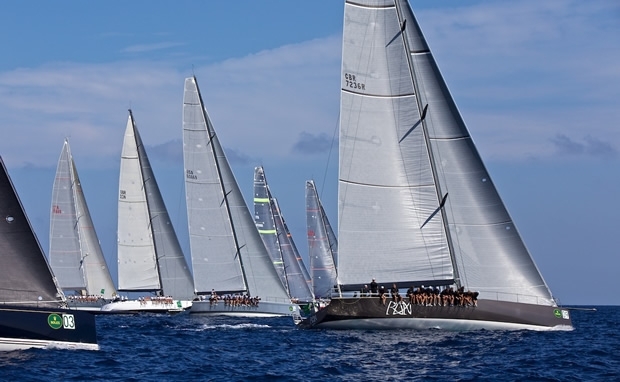 Altair by Robertissima has enjoyed the most dominant week of any boat. A fourth straight win secured the Maxi Racing/Cruising division with one race to go. The crew of Filip Balcaen's 112ft Nilaya are also celebrating following overall victory in the Supermaxi class. This despite a first defeat in Porto Cervo since 2011. Firefly took the spoils in the coastal race although a second place was enough for Nilaya to reach her target - a third consecutive Class title. "It's fantastic to win three in a row with one day to spare. Even if today was not our best day and Firefly sailed very well. Tonight will be a little bit of a celebration," explained Nilaya tactician, Bouwe Bekking. Tomorrow's decisive day sees windward/leeward races organized for the Mini Maxi Rolex World Championship, and a final coastal course for the remainder.